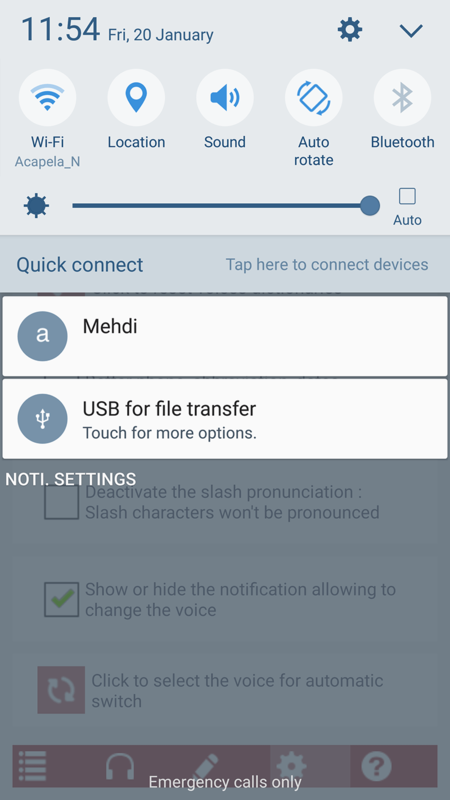 1/ Tap the application icon ‘Acapela TTS Voices’. 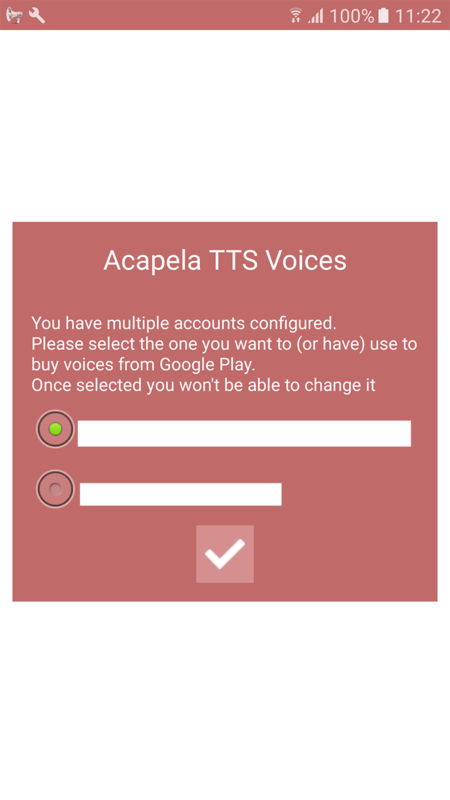 However, beforehand, check that you have a valid data connection, as Acapela TTS Voices app will need to contact the server to check voice status. 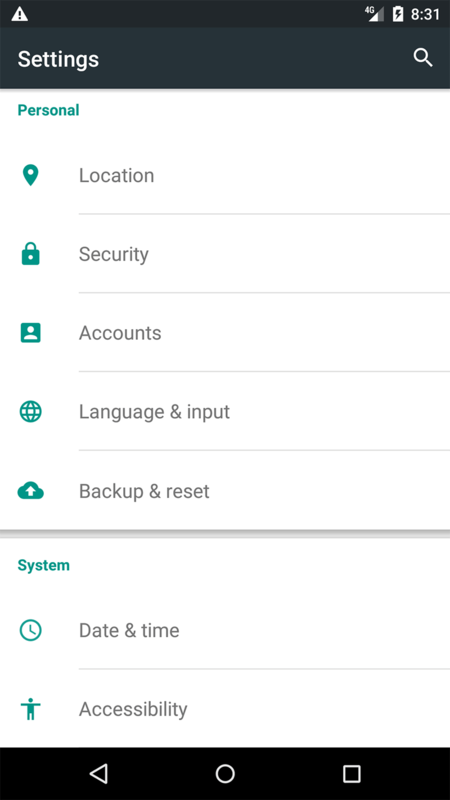 2/ If you have more than one Google account, select the one associated with your Google Play account. WARNING: once bought with an account the voice is linked to this account. You will not be able to change this afterwards. In case of account selection error, uninstall the application and install it again. 3/ Browse the list of voices retrieved from our servers. 5/ Click on the cart button to purchase the voice. 6/ After the purchase, click on the download button to download and install the voice. Note: the amount of data to download is between 20 & 30 MB. If you don’t have a ‘flat’ data plan, consider connecting your smartphone to a Wi-Fi access point instead of using your GPRS/3G/LTE connection. 7/ The voice will then be downloaded from the servers. In case of permanent error, restart the application and/or retry later. If the problem persists, go to help menu and click on ‘Send mail’ button, describe your problem and send the email. 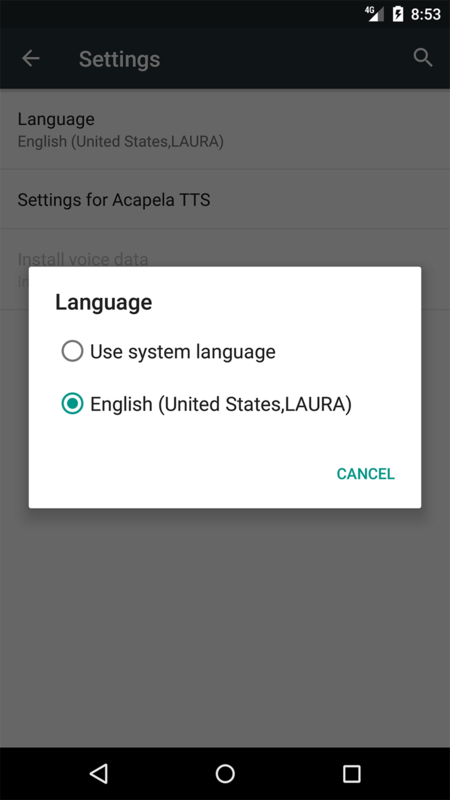 8/ If this is the first time you have downloaded a voice, and want to use it as the default Android TTS voice, you will have to set up your device in order to set Acapela TTS as the default TTS. 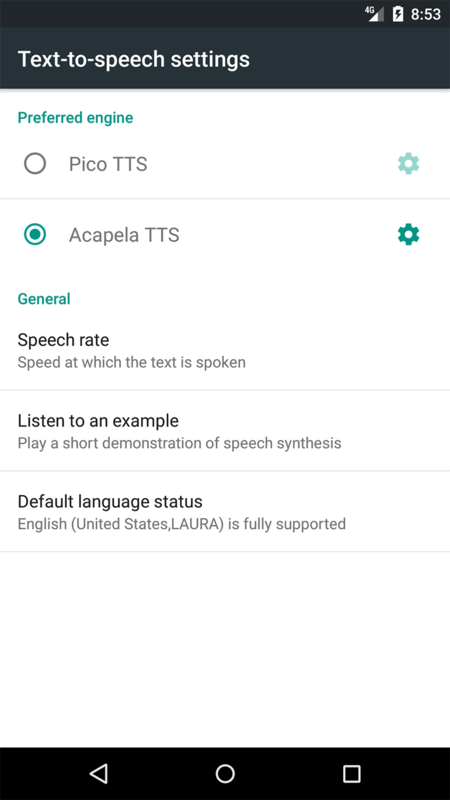 Click on the settings button in Acapela voices to access directly to the Android TTS settings OR Go to Android ‘Settings’ and browse to ‘Language and input’ -> Text-to-Speech Settings’. Select ‘Acapela TTS’ in order to enable it among the default engines. Then click on the Acapela TTS settings button and set the voice you want to use. 9/ Once installed the voice will appear with a star icon. 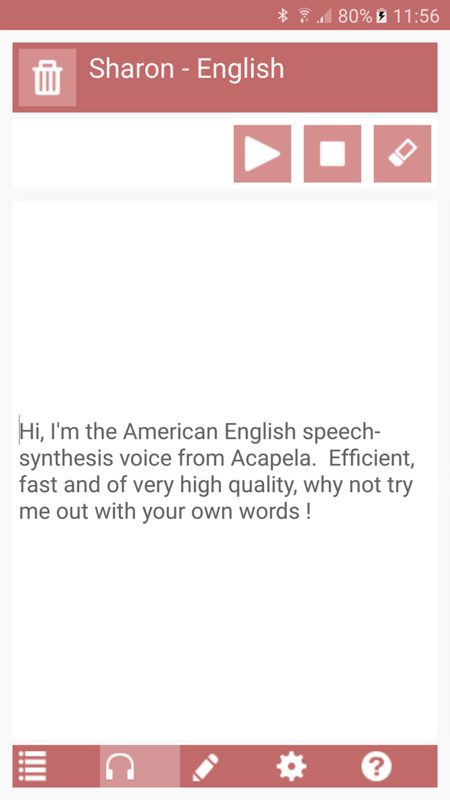 You can use it with any TTS compatible application or with the Acapela Voices Reader. HOW TO MODIFY THE PRONUNCIATION OF WORDS, EXPRESSIONS AND ABBREVIATIONS? 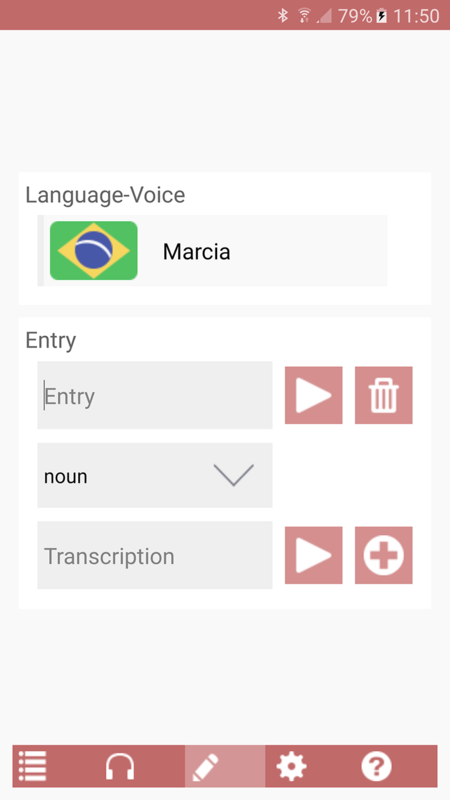 The new dictionary editor allows you to modify the words, expressions, and abbreviations pronunciation. To do that, simply enter the word/expression you want to tune in the entry edit field. Select the entry nature (word, verb, adverb…) as this can impact the pronunciation way. Then enter the corresponding transcription/modification. Finally click on the add entry button to save. A dictionary is common to all voices of the same language. If the entry is all in lower case any matching entry will be tuned. For example is the entry is hello in lower case any hello word (hello all in lower case, Hello with first letter in upper case, HELLO all in upper case) will be tuned. 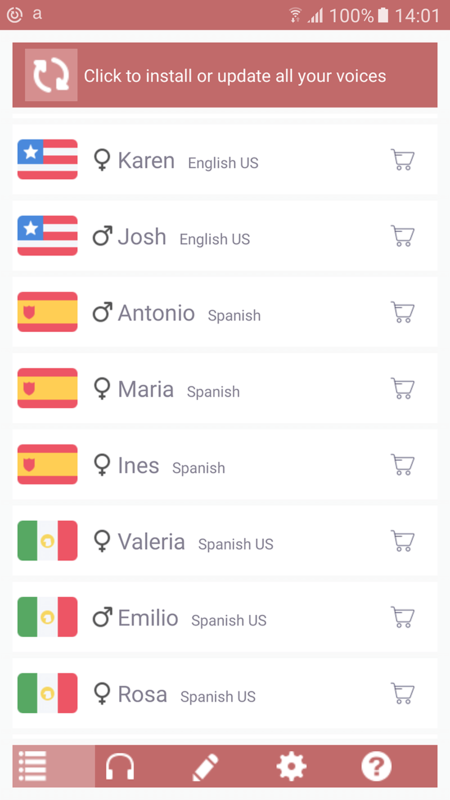 Import/Export: dictionaries can be exported/imported between devices. 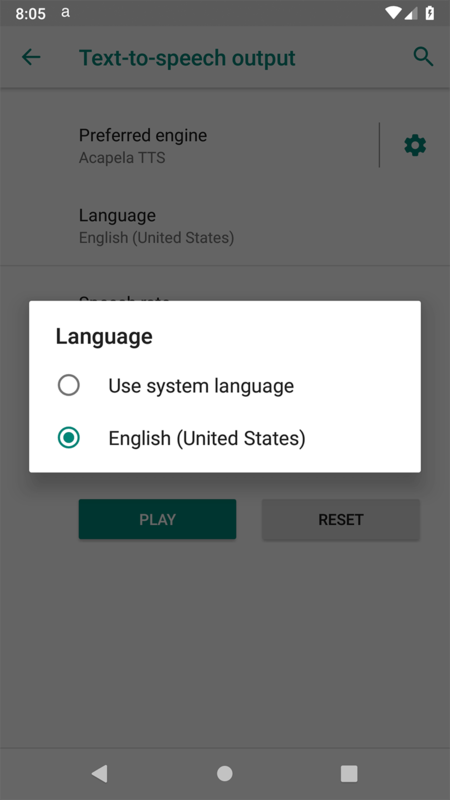 To do that simply exports your dictionary (in the application settings window) They will be exported as a zipped file in your android download folder. Then put this zipped file in the android download folder of your other device. 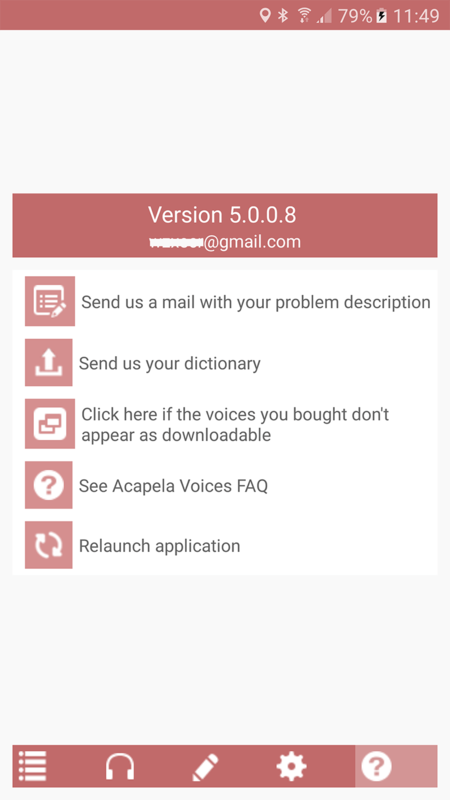 Open the Acapela Voices application and click on import button. HOW TO FORCE SPEED/PITCH OPTION? 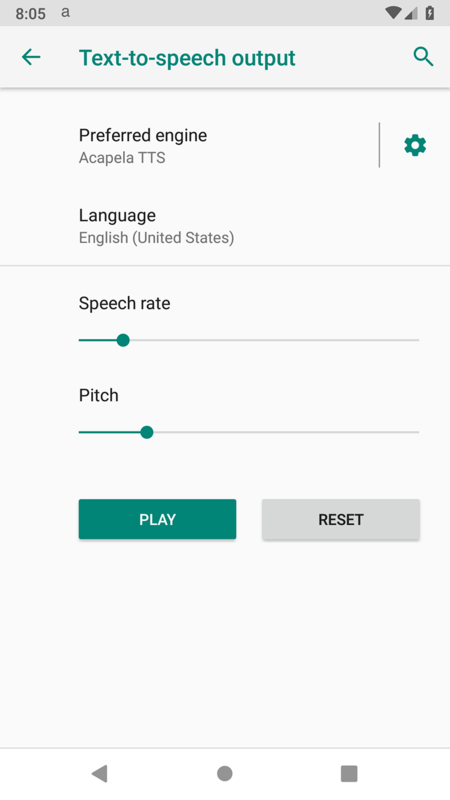 You can now override the Android or application settings for the speed/pitch option. 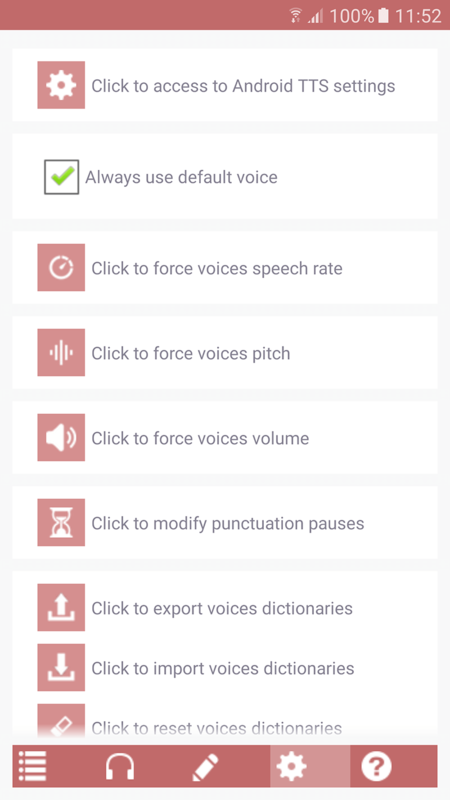 Simply click on the ‘Click to force voices speech rate’ or ‘Click to force voices pitch’ to select the value you want . Select ‘System or application value’ to deactivate the option. HOW TO QUICKLY SELECT ACAPELA TTS AS THE DEFAULT VOICE? 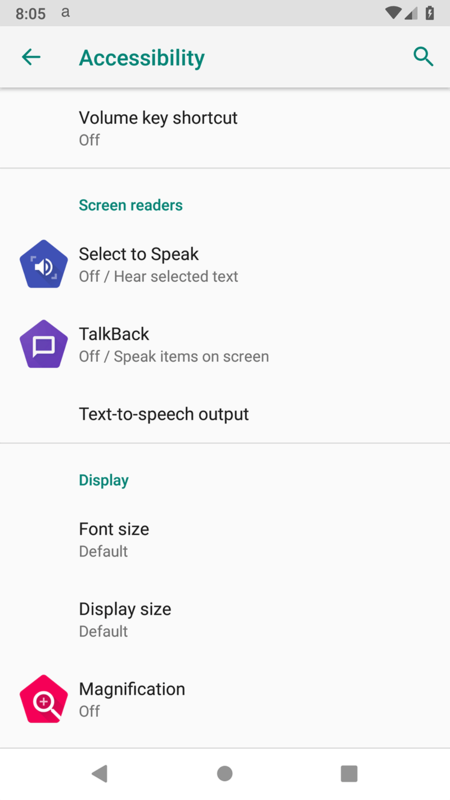 You can set a default voice as the voice to be used whatever the Android TTS settings says or the settings selected by the application you use. By doing this you can then select the ‘real’ Acapela Voice to be used by several quick ways without having to go to the android TTS settings anymore. The voice can then be changed quickly and on the fly (if you use talkback for example). Then when talkback is speaking if you click on the widget or in the notification it will change the voice immediately. 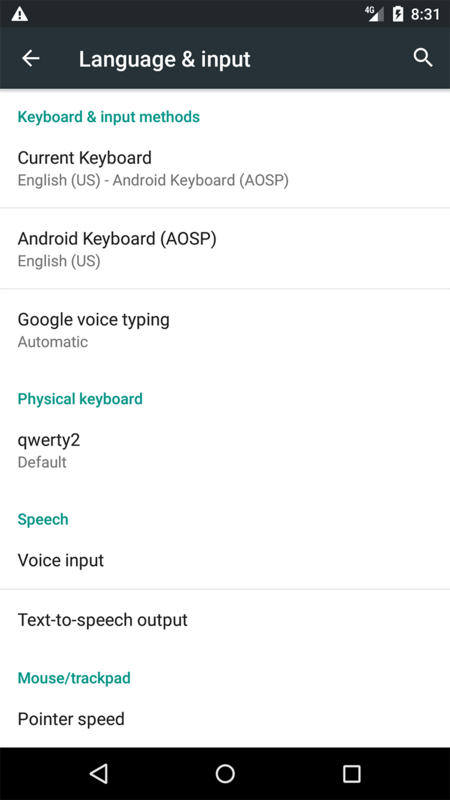 No need to go each time in the Android TTS settings to change the voice. A single click does the trick. 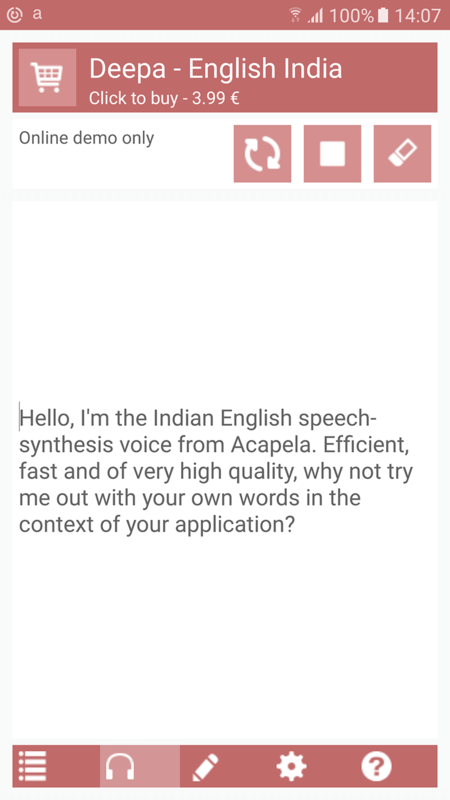 Once done, you can set the real voice to be used in the Acapela Voice application or with the new widget. To add the widget click on the applications list button from your home screen, then select the widget tab and click and hold to the Acapela widget to set it on your home screen. 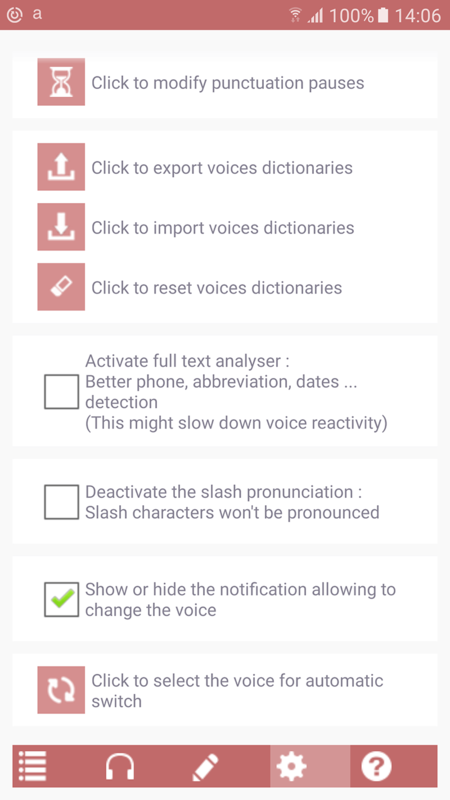 With the notification : Click on ‘Show or hide the notification allowing to change the voice’ in the application settings. This will display a notification in the notification bar. 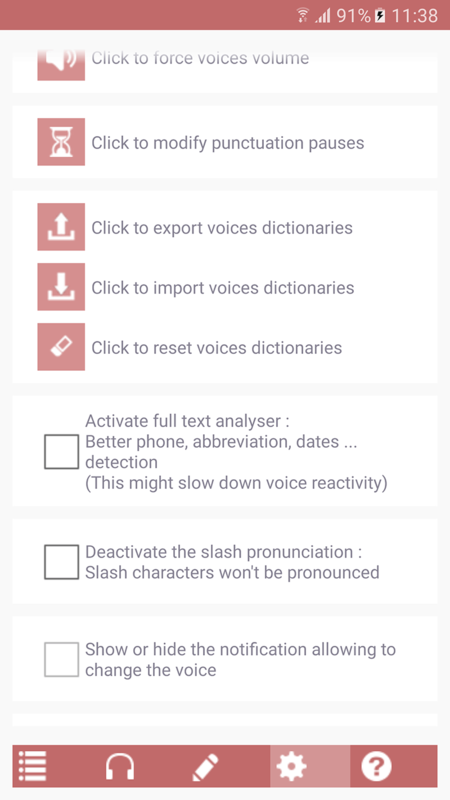 By clicking on it you will be able to change the default voice. 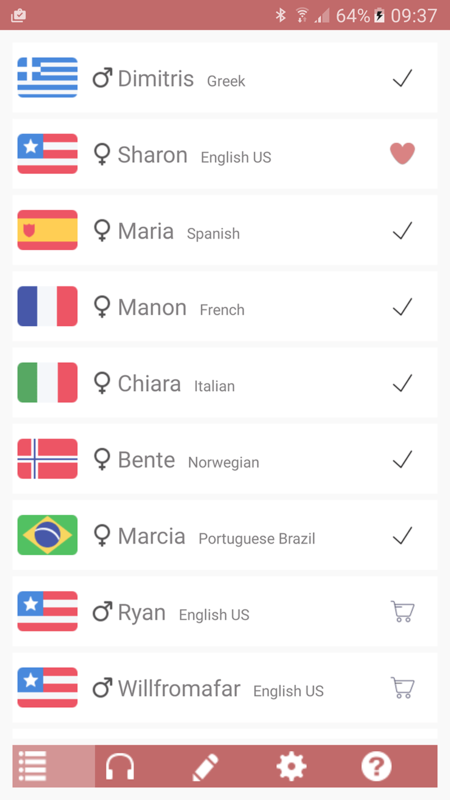 You can now try any of your voices with your own text before deciding to buy it. To do that simply click on any voice and you will be prompted to the Reader. Then enter your text and click on play. 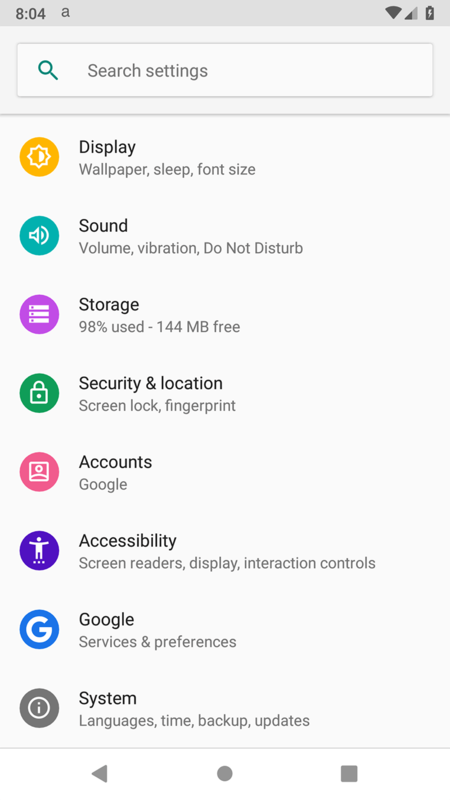 You need to be connected to a network to use this feature. Note that as this feature requires to contact our server, some latencies can occur depending of the quality of your connexion (and the load of our servers). Once purchased, our voices are completely local and doesn’t require a connexion. 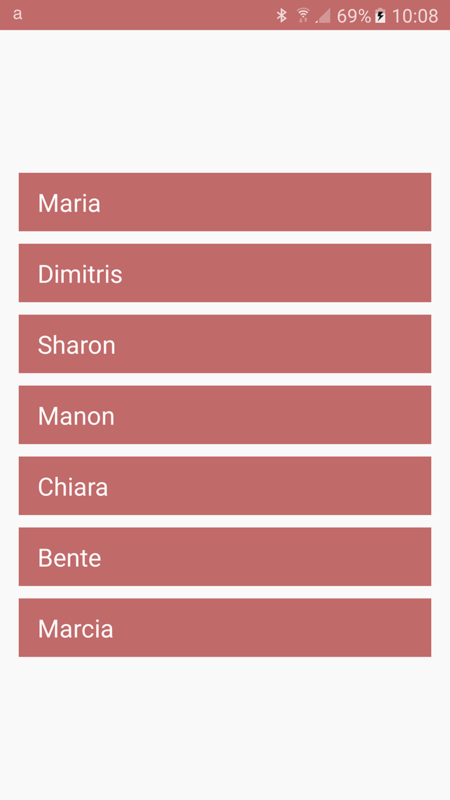 HOW TO INSTALL ON MULTIPLE DEVICES? 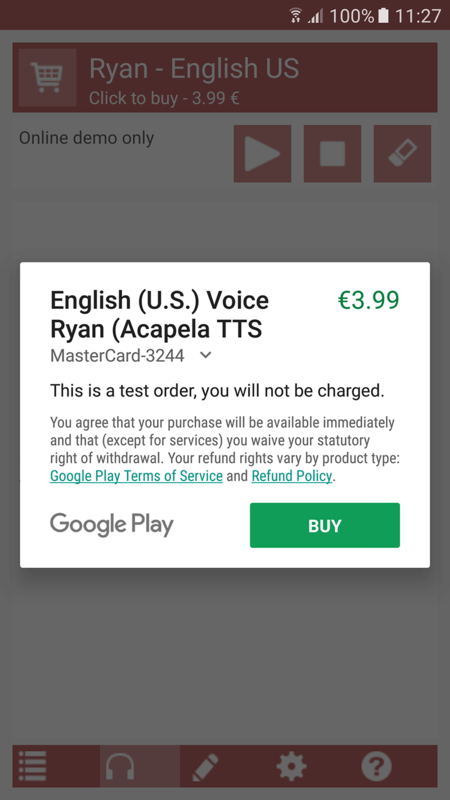 You can install Acapela TTS voices on another device and download the purchased voices for free, but only if you have selected the same Google account used when the application was first launched. If you are using a different Google account, you will have to buy the voices again.